What happens to property when a Thai wife dies? I am a 58-year-old retiree. My wife is only a few years younger than me. Since getting married 5 years ago we have bought a house and land in Thailand. My wife has a good job in IT and we both contribute [more or less equally] to our living costs. The land and house are in the name of my wife which I don't have a problem with. My question is this: In the event of my wife dying before me what would be my situation? Would I be sole owner of said property? I know foreigners cannot own land in Thailand so would I have to set up a company just to stay in the house? 1. Your wife can make a will where she should mention what actually will happen with the land and house after her death. 2. You can obtain a usufruct for your lifetime or 30 years. With Usufruct land and house generally is not sold and if it is. You would still be able to stay as long as the Usufruct allows. 3. If the property were purchased during the marriage, you have martial rights, but you can't can't sell it. Your wife should appoint an executor, who will be the responsible person for the sale should she pass away. One of her family members can be appointed with your written approval. Sunbelt Asia Legal Advisors https://www.sunbeltasia.com/usufruct-agreement-thailand has extensive experience in drafting usufructs and wills and would be happy to meet with you in free initial consultation to discuss the best alternatives for you. My wife recently bought a 10 rai plot of agricultural land, jointly with a friend and neighbour (50/50) Both names are on the chanote. In the event of the death of one of them, does the survivor automatically acquire the deceaseds share (as happens with joint bank accounts) or is the deceased's share of the land distributed in accord with a Will or the Thai laws of intestacy? Under Thai law if the land is government agricultural land then it cannot be transferred except to direct relatives such as children, father, brother, sister mother or spouse . In case of a divorced spouse an exception can be made if the receiving end is doing agriculture and has no land of his / her own. If the land has a chanote title then if one of the owner’s dies without a will it would first go to the spouse, then children, then parents according to Thai inheritance laws. If there is a will then it would go to whomever is listed as the beneficiary in the will. However, as the foreign spouse you cannot own the land should it be your wife that passes away and you will have one year in which to sell your share. I've got a Thai female friend that lives in Pattaya. She slept with an Italian guy and got pregnant. The guy also lives in Pattaya and owns a business. She told him she is pregnant with his child and he told her he wants nothing to do with her or the baby. Is he legally obligated to pay child support? If so, how strictly is that enforced in Thai courts? If the child is born out of wedlock, even if the father is listed on the birth certificate, he is not considered the legal father until DNA tests are done to prove it. However, the mother can take the father to Court to force a DNA test and once proven the father, he will be required to provide child support. Sunbelt Asia Lawyers https://www.sunbeltasia.com/ have had child support cases like this before and can help your friend. The Board of Investment announced last week that applications for BOI investment promotion privileges rose 8 percent in the first nine months of 2017 from a year earlier, and the state investment promotion agency expects to meet its target of 600 billion baht this year. Thai and foreign investors submitted investment applications worth a combined 376.6 billion baht (US$11.51 billion) during the period from January to September with Japan remaining the biggest investor. So far the BOI has reached 63 percent of its target which the director believes is achievable. Of the investment pledges in the first nine months, 104 billion baht were projects in the Eastern Economic Corridor (EEC) development area. The BOI approved a two year extension of privileges in the EEC, existing privileges were due to expire at the end of this year. The board approved an extension of the corporate income tax exemption from the existing eight years to 10 years and a 50% cut on corporate income tax for an additional five years after the tax holiday. The new privileges will be offered in three special economic zones in the EEC; U-Tapao International Airport, the Eastern Economic Corridor of Innovation (EECi) and Digital Park Thailand (EECD). The government is also scheduling big infrastructure expansion plans for the EEC in 2018 including improvements to roads linking Laem Chabang port and U-Tapao airport, a Map Ta Phut port expansion, development of highways in the three EEC provinces, the third phase of Laem Chabang port, an aircraft repair and maintenance hub at U-Tapao and the Bangkok-Rayong high-speed rail network. The 158-billion-baht Bangkok-Rayong high-speed rail network is required to settle the terms of reference (ToR) and the public-private partnership (PPP) process by January, the project will be put out for bids in July and operations are scheduled to begin in 2023 linking U-Tapao, Suvarnabhumi, and Don Mueang International Airports. International tourist arrivals jumped nearly 21 percent in October compared to the same period last year. Foreign arrivals reached 2.72 million in October, of which the majority were Chinese, Malaysians then Laotians. Chinese were the biggest spenders followed by the Russians and then the Malaysians. In 2016 Thailand hit a record 32.6 million tourist arrivals, in the first ten months of the year tourist arrivals grew 6.7 percent year on year to reach 28.8 million. East Asian had the highest numbers of arrivals followed by Europe, South Asia, and the Americas. The Ministry of Tourism and Sports is expecting 33-34 million tourist arrivals this year. Tourism accounts for 12 percent of the GDP. Phuket International Airport should see relief in airport congestion this week as the new renovated wing in the airport's old terminal is scheduled to re-open on Tuesday. The renovated area will open up 23,000 sqm and will service both departing and arriving domestic passengers. Phuket International Airport expects daily aircraft movements to jump to 300 each day with 50,000 passengers moving through the airport during the high season, which normally runs through to the end of March. The entire old terminal is scheduled to be opened by June 2018 and should boost the airport's capacity to 12.5 million each year, up from the previous 6.5 million. The new international terminal opened in September last year. 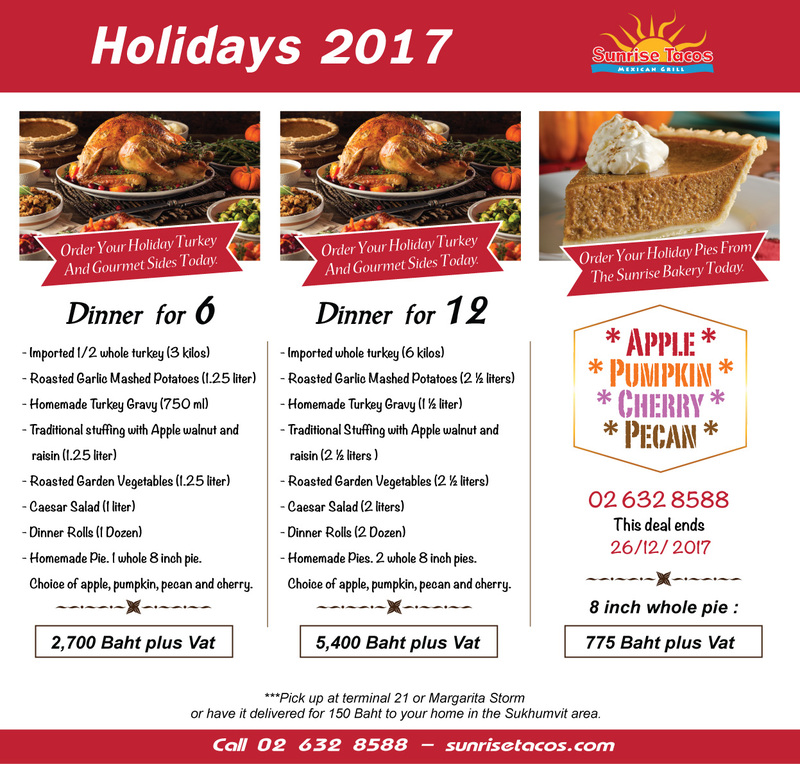 For our guests in Bangkok who would like us to prepare your hot turkey dinner we offer several packages with traditional sides and fruit pies so that you can dine at home with family and friends in Bangkok. Special offer on serviced offices extended through November!! Happy anniversary from all of us at Sunbelt Asia!! A "Thank you" gift for our clients new and old! Sunbelt Asia has been offering our excellent service to our clients for 15 years! As our 15th anniversary gift we would like to offer our professional services on retirement and marriage visa extensions at the very special reduced rate of 7,500 baht as a thank you to our clients new and old for their support over the years. Sunbelt Asia Legal Advisors can handle all your legal and business needs; from visas to work permits, prenuptial agreements to divorces, condo purchases and wills. Sunbelt Asia is offering first class Serviced Offices in a prestigious office building in a prime location starting at 10,000 Baht. The first month is free for a six month contract! Paperwork for you to register your address - We know the process so no need to wait 2-3 weeks for it to be processed. Have your own three to twelve month office priced between 10,000 baht and 20,000 baht per month. The location of your new office in Bangkok is prime as it is connected to the Rama 9 Mrt Station. First month free on a six month contract! Two month deposit required. Please feel free to contact us if you are in Thailand on +662-642-0213 to discuss any of these listings. This long-running hotel and restaurant was fully renovated just this year for a new, modern look. Located on Pattaya 2nd road, the hotel now has an up-to-date, modern kitchen, bar, and restaurant with classic decor. There is an outdoor dining space as well and the entire restaurant seats 50 people. The hotel has 14 rooms over 4 floors, in a three unit shophouse. Rent on this large space is only 100,000 baht per month. The hotel has income from a tour company of 15,000 baht a month, reducing the total overall rent to 85,000 baht a month. The lease is set for 4 years plus 3. There are 6 staff with a total monthly payroll of 70,000 baht a month. Located right on the main road and with good lease terms, this is a deal. The owner is moving to Bangkok and so must sell the business. The sale includes all new equipment and the fully renovated restaurant and bar as well as a Thai company with work permit. Sunrise Tacos is the biggest and most popular Mexican restaurant chain in Thailand. This is your opportunity to join the successful Sunrise Tacos franchise team. This great location in the beautiful Terminal 21 mall in Pattaya scheduled to open next year is now available for one lucky restaurateur. Centrally located right in the middle of the third floor food court, this is a prime location in this new mall available only to Sunrise Tacos. The opening of Terminal 21 Pattaya is highly anticipated and there is a huge waiting line for space in the food court. Terminal 21 has been a huge success with its unique concept in Bangkok and Khon Kaen and the buzz about the new mall in Pattaya is predicting another huge success for this uniquely branded mall. The owner of Sunrise Tacos is very excited about this new location, he loves the Terminal 21 and the Sunrise Tacos in Terminal 21 has proven to be very successful. This is a great location for great Mexican food. This space includes enough area for seating, making it a proper restaurant for guests. Lease on the 77 sqm area is 2500 baht a square meter not including the Common Area Fees which are 360 baht per sqm. There is a 3 + 3 year lease available. Costs of the build out are not included - and will run around 6 million baht - but this prime space is only available for a new Sunrise Tacos franchise. A well-known and long-running travel agency in Kanchanaburi is now available with property included in the sale. The agency handles inbound tours to the popular province. Holding the valuable TAT license the business is turnkey for the new owner. The sale includes the shophouse with the business. The building is 320 sqm and the buyer will be owning a chanote title property. Last year's sales reached 4.5 million baht with a net profit of 1.04 million baht. There are six employees with experience in the business with a total monthly payroll of 80,000 baht. There are several part time tour guides the company can hire freelance as needed. Board of Investment promotion offers the owner special tax privileges as well as work permits. This BOI business is located in Samut Sakhon province just outside Bangkok and manufactures dried fruits for export to China. Fully licensed and approved by the FDA, as well as a Halal certification, this business has only just now started taking off. BoI promotion means tax cuts and other incentives to help the business thrive. Take advantage of this great opportunity for a business that is ready to go and just requires a motivated owner to take the reins. The factory is in a two story building with offices and factory located on 1.28 rai of land. The factory and equipment is all new and in top condition There are ten full time employees with a monthly payroll of 150,000 baht. The business has only just started running and the owner is forced to return to his home country so the new owner is stepping into a brand new and ready to go business. Located in Bangkok, the factory is in the Nhongjok area and manufactures PVC foam board for use in furniture, home and garden décor. The company has been in business for about a year and has been doing very well. Sales last year reached 26 million baht with a 10 million baht profit. The factory is 1900 sqm with a monthly rent of 50,000 baht and a 2 year lease. There are 10 full-time and 10 part-time trained employees in the business, monthly wages are 120,000 baht. The owner has another business that takes up most of his time and so is wishing to sell the business. The buyer can purchase just the business or can also purchase the warehouse and 4 rai of land near the main road. A chic new French-apartment style bistro in Siam Paragon that opened only this year and has already garnered great reviews for delicious food and a charming atmosphere is now available. Siam Paragon is one of the top luxury shopping malls in Bangkok and known for a variety of great restaurants, and is often a destination just for meals. It's great for those seeking to avoid the traffic but still want delicious home-style French food. There are 12 staff with a total monthly payroll of 191,800 baht, rent on the 132 sqm space is 435,100 baht a month while sales in the first six months have already reached 7.8 million baht. The owner is moving overseas and so is selling the business. This leading specialist software provider is seeking investors to expand the business. Providing logistics and supply chain businesses with key software in Thailand, India, Malaysia and Indonesia for the past 12 years, the company is looking to expand further into Thailand and a total of eight countries and is seeking a committed investor to fund the centralized team that will manage the expansion The company already has joint venture partners in every country show share 49% - 50% in those countries. By the end of 2017 the company should be operation in 8 - 10 countries. Located near the BTS station on Silom road, this chic and modern bar and restaurant is perfect for someone looking for a brand new restaurant on which they can make their own imprint. The owners fitted this great location out just last year but have since closed the business and moved it to another location. They are looking to sell this fully fitted out restaurant including the lease. The restaurant has 239 sqm of space including a charming outdoor space that proved very popular. Rent on the space is 75,000 baht a month and the lease is for 3 years. The owners invested 6.5 million baht in fitting up this chic bar and restaurant but because of the other business are selling at an assets sale price. Interested in joining the most successful and popular Mexican restaurant franchise in Thailand? Sunrise Tacos is seeking qualified franchisees to join us in our commitment to quality and healthy, delicious food. Are you experienced in hospitality or business management but want to strike out on your own? Sunrise Tacos is seeking franchisees fully committed to the Sunrise Tacos way; with a hands on approach to running the business and experience in hospitality or business management. The leadership at Sunrise Tacos prides itself on maintaining a close and personal relationship with each of our franchisees and looks at franchising as a long-term business partnership. We are committed to our franchise partners and helping them grow. With the opening of the ASEAN Economic Community at the end of this year we at Sunrise Tacos see the potential for growth in the region. If you want to be a part of that potential let us know! We already have a branch in Phnom Penh and have added more around Thailand, including our new franchise in Chiang Mai, and are seeking committed, enthusiastic business minded people to join us. Contact [email protected] for more information.